On the 7th (Sat), take in the spiritual surroundings of Durgiana Temple. To find traveler tips, reviews, maps, and tourist information, you can read our Amritsar road trip site . Goa to Amritsar is an approximately 7-hour combination of bus and flight. You can also drive; or take a train. When traveling from Goa in December, plan for slightly colder days and cooler nights in Amritsar: temperatures range from 24°C by day to 6°C at night. Finish your sightseeing early on the 8th (Sun) so you can travel to Katra. Start off your visit on the 9th (Mon): take in the spiritual surroundings of Vaishno Devi, make a trip to Bhairo Baba Temple, then don't miss a visit to Baba Dhansar, and finally take in the spiritual surroundings of Nau Devi Temple. For reviews, photos, maps, and tourist information, use the Katra trip planner. You can drive from Amritsar to Katra in 5.5 hours. Finish your sightseeing early on the 9th (Mon) to allow enough time to travel to New Delhi. Step off the beaten path and head to Gandhi Smriti and Rashtrapati Bhavan. 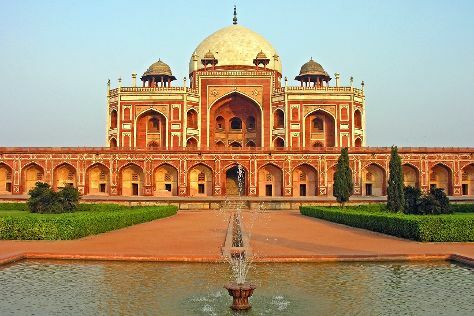 There's still lots to do: tour the pleasant surroundings at Humayun's Tomb, take a stroll through Hauz Khas Village, contemplate the long history of India Gate, and admire the striking features of Qutub Minar. To find other places to visit, maps, ratings, and more tourist information, read our New Delhi road trip site . Explore your travel options from Katra to New Delhi with the Route module. In December, plan for daily highs up to 27°C, and evening lows to 10°C. Wrap up your sightseeing on the 12th (Thu) to allow time to travel to Pune. On the 13th (Fri), contemplate in the serene atmosphere at Sri Balaji Mandir, then explore the historical opulence of Sinhagad Fort, then take in the spiritual surroundings of Sarasbaug Ganesh Temple, and finally see the interesting displays at Darshan Museum. Here are some ideas for day two: contemplate in the serene atmosphere at Kasba Peth Ganpati Temple, contemplate in the serene atmosphere at Parasnath Jain Tirth, identify plant and animal life at Taljai Hill, then take in the spiritual surroundings of ISKCON NVCC Temple, and finally contemplate in the serene atmosphere at Dagadusheth Halwai Ganapati Temple. To see photos, reviews, traveler tips, and tourist information, refer to the Pune trip builder site . Traveling by flight from New Delhi to Pune takes 3.5 hours. Alternatively, you can drive; or take a train. Wrap up your sightseeing on the 14th (Sat) to allow time to travel back home.